Lenovo's 17-inch Legion Y740 gaming laptop really isn't that different from its predecessor, the Y730, which I reviewed last year. 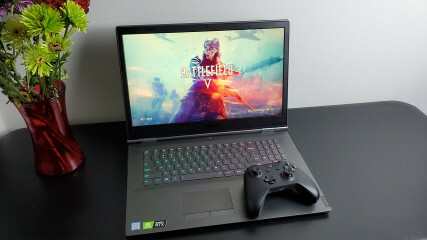 The main difference that you'll find is that rather than the mediocre Nvidia GeForce GTX 1050 Ti GPU that was on the older one, the Y740 has a GeForce RTX 2080, which is a significant difference in performance. 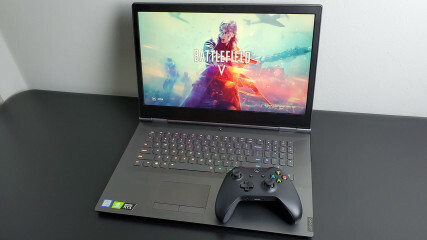 Interestingly, when I was briefed on the Y730, Lenovo told me that whenever Nvidia decided to launch its new GPUs, those PCs would be offered with the new graphics cards. Apparently, the company decided to brand it as a new model though, with some other minor improvements. But Nvidia's new RTX cards are kind of a big deal. They support features like ray tracing in games, and deep learning super sampling (DLSS). HP's OMEN Obelisk was the first desktop I reviewed with RTX, and it was literally game-changing. Nvidia finally announced the mobile versions of the GPUs at CES, so here we are. In customizing the device on Lenovo.com, your main options for upgrading from here are for more RAM at 32GB and a larger SSD at 512GB. There are more inexpensive models though, as you can have it configured with an RTX 2060, although there's only one CPU option. As I mentioned, the design is pretty much the same as last year. It's a more industrial design, and I was a fan of it as soon as I saw it. 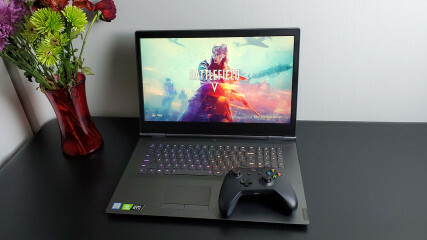 It's not as flashy as some gaming laptops that you'll see, and it's a massive improvement over the Legion laptops from two years ago. The idea is that it looks professional when you need it to, and it's still a powerful beast when you need that. Lenovo pulls it off quite well, and it's clear that there was a lot of thought that was put into the redesign. The color is Iron Grey, and that's exactly what it sounds like. 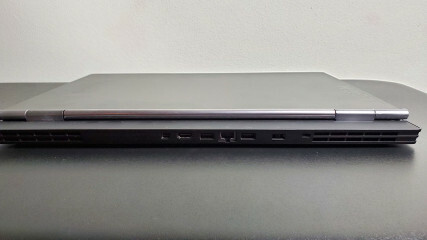 It comes in an aluminum body that looks sleek and professional, but this thing is massive. Indeed, with a 17-inch display and starting at 6.4 pounds, you'll feel this thing in your bag, if you can even fit it in there. 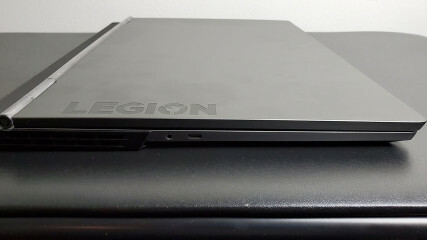 Lenovo sent me the 15-inch Legion Y740 as well, and that's much more manageable. But this is all personal preference. It all depends on what you care about as a gamer. 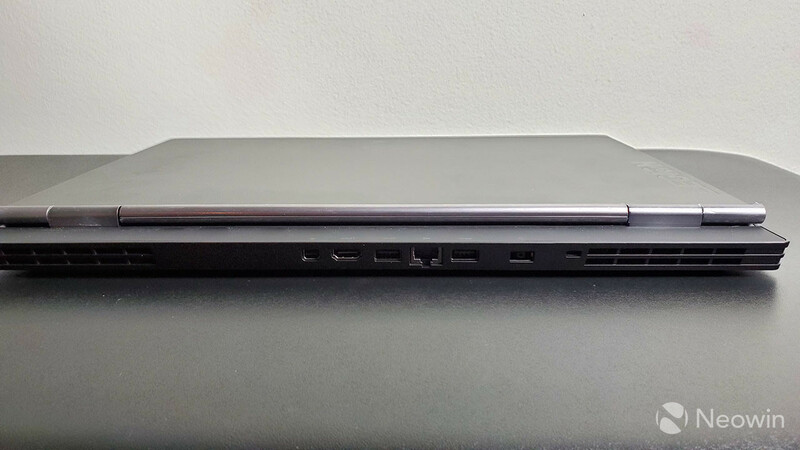 If you're planning to take your laptop on the road a lot, you should probably be looking at something more portable like the 15-inch model. If it's an occassional thing, the more powerful 17-inch model could work for you. If not at all, then get a desktop. 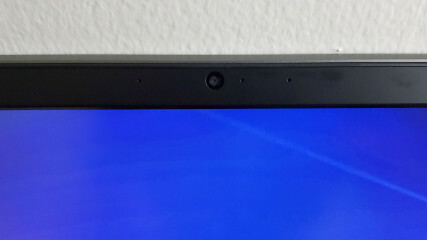 What's strange is that the bezels are still quite large, where they've shrunken down on the 15-inch model. This one keeps the webcam on top though. Still, I'd have liked to have seen this in a smaller footprint. 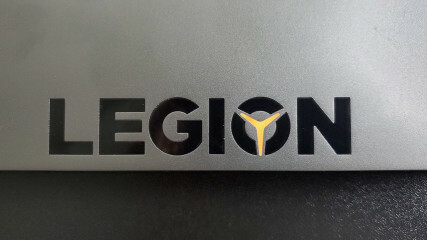 Along the side of the aluminum lid, you'll see the Legion branding, with the Legion logo inside of the O. 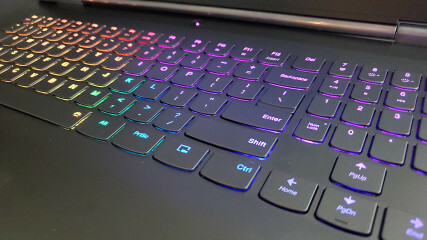 That logo includes Corsair RGB lighting, as is also included in the vents and in the keyboard. One nice thing that we got with last year's redesign is much better cable management. 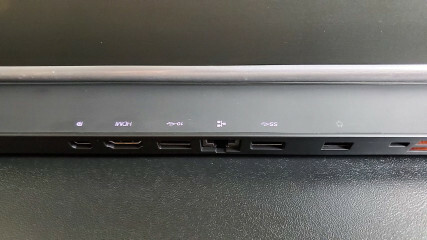 Most ports are on the back of the unit now, including two USB Type-A ports, Ethernet, HDMI 2.0, Mini DisplayPort, and Lenovo's proprietary charging port. On the left side, you'll find a Thunderbolt 3 and a 3.5mm combo audio jack, and on the right side, there's another USB Type-A port. 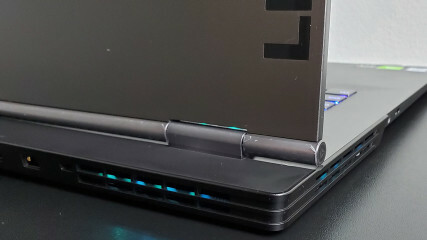 It's a good design, one that's common in powerful laptops with lots of ports. The idea is that you don't want cables in your way, so they go out the back. But there are also a few ports on the sides for when you need to plug in a peripheral on the fly. There's one little quirk though. 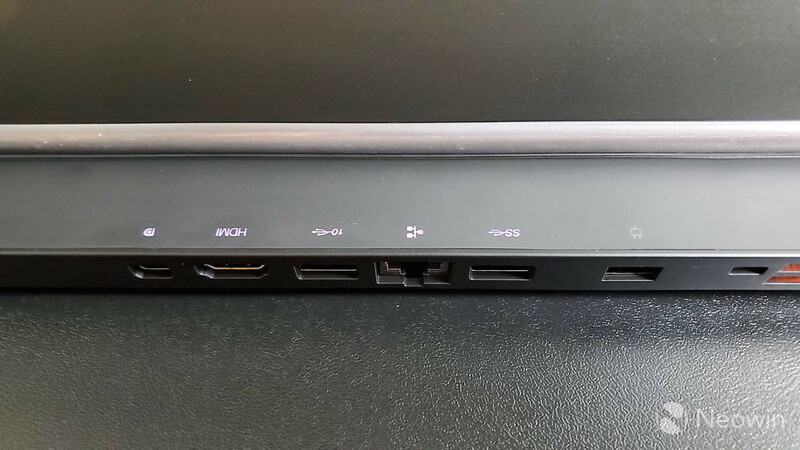 As you might have noticed in the specs, two of the USB Type-A ports are USB 3.1 Gen 1, which supports data transfer speeds of 5Gbps. The other one is USB 3.1 Gen 2, which supports speeds of 10Gbps. If you thought that the one USB 3.1 Gen 2 port was the one that stands on its own, on the side of the device, you'd be wrong. 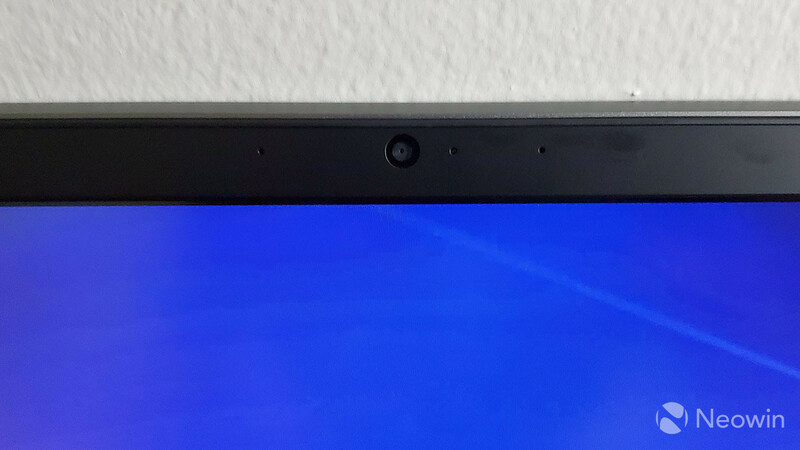 It's one of the Type-A ports on the back, only identified by the '10' logo instead of 'SS'. In the back and on the sides, you'll find the vents. Lenovo placed two fans in the back corners, and with vents on two sides of each one, they can push out more hot air. I'm going to be honest. 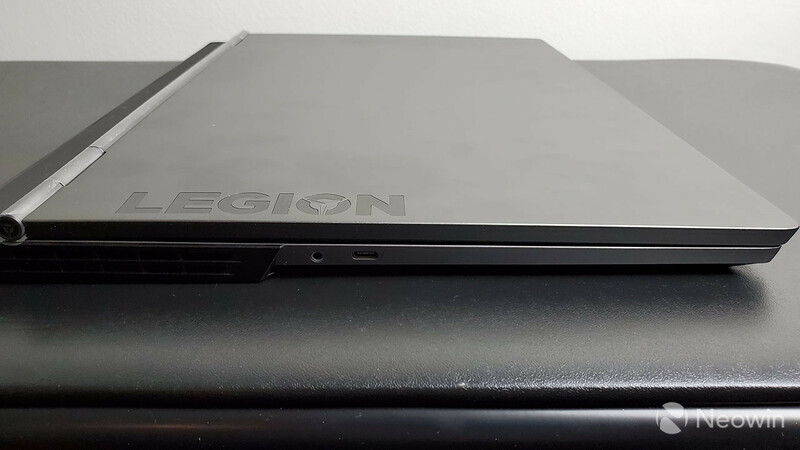 It bums me out a little bit that Lenovo doesn't offer the Legion Y740 with a 4K display, but that's only because I use my laptop for a lot of things. One improvement that was made for this model over the Y730 is that while it's still 1080p, it comes with a 144Hz refresh rate. Previously, it was 60Hz, and that's what it would be if there was a 4K option as well. So if you're only using the machine for gaming, the higher refresh rate is what you probably want. A refresh rate is exactly what it sounds like; it's how often the display refreshes. With a higher refresh rate, it could mean that split second difference in your response time in a game. 1080p also means better performance. A Full HD screen has about 2.1 million pixels, or 2.1 megapixels. 4K would be 8.3 megapixels, which is a lot more for the GPU to push. If the resolution isn't enough for you, you can always use the HDMI, Thunderbolt 3, or Mini DisplayPort to output to something else. As far as display quality goes, I found it to be impressive. It's bright, and the matte anti-glare screen doesn't look washed out, as many anti-glare displays do. There's no touch, but that's not something you want in a gaming laptop. A false touch could seriously mess up your game in the wrong moment. 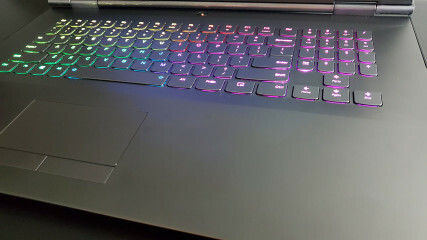 The keyboard is the same as it's been in Lenovo's gaming laptops, with the exception of the Legion Y920. If you're looking for the mechanical keyboards you'll see in premium gaming PCs, you won't find it here. Personally, I like it better this way. 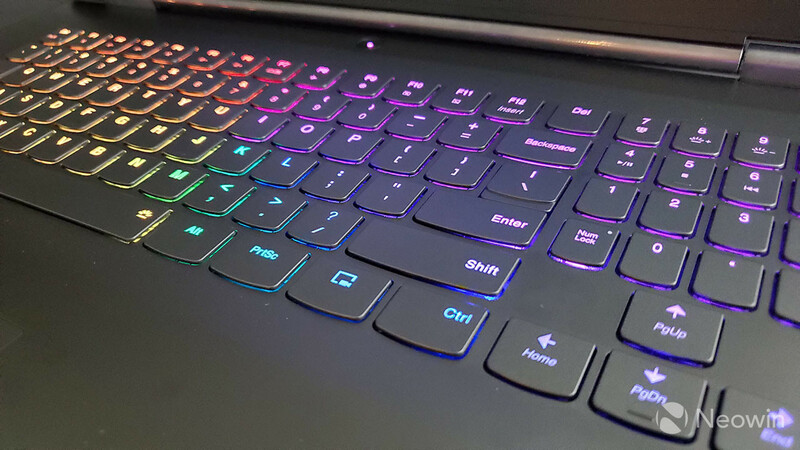 While a mechanical keyboard might be better for precise gaming, I like a standard laptop keyboard for actual typing. The Lenovo Legion Y740 is really meant to be your one machine for both work and play, so a keyboard that does both is optimal. And Lenovo always has great keyboards, and the company says that this keyboard has a less than 1ms response time. This machine is big, so the keyboard does have a number pad to the right of it. That also means that the main keyboard is off-centered to the left, as is the trackpad. Unfortunately, the trackpad is not clickable, and it's also not very large considering the size of the PC. There are two buttons below it, as you'd expect from a trackpad that's not clickable. 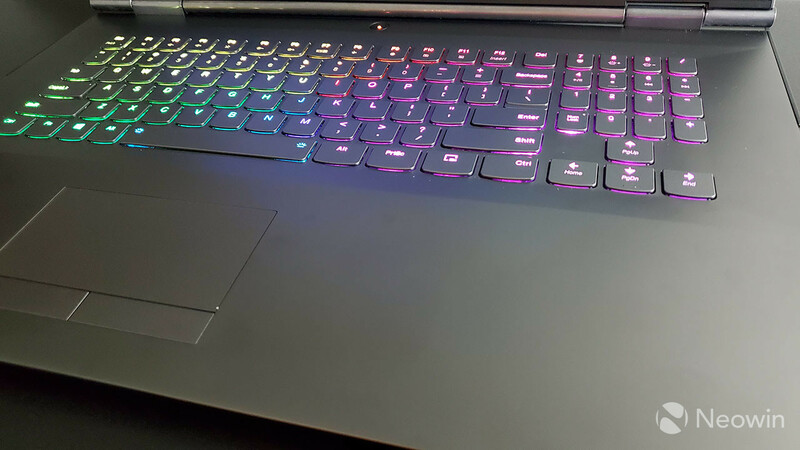 The keyboard is lit up with Corsair iCUE RGB lighting, as is the Legion logo and the vents in the back corners. Personally, I think this was done quite well. The areas with RGB lighting don't try to go too far; it's not too flashy. The one thing I don't like is the Corsair iCUE software. 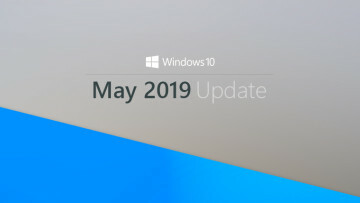 A couple of years ago, Lenovo used to have a bunch of apps on its laptops; there was one for system settings, one for driver updates, and so on. 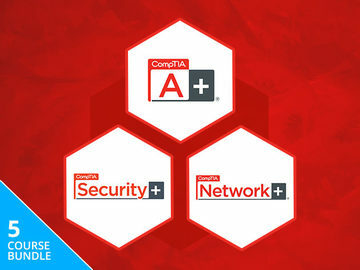 These were combined into Lenovo Vantage, which still exists. 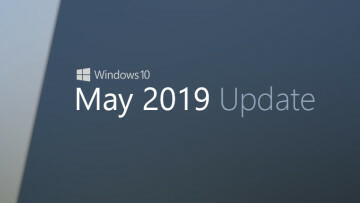 Don't forget that you still need Nvidia's Geforce Experience for those driver updates, and then of course, there's Windows Update. 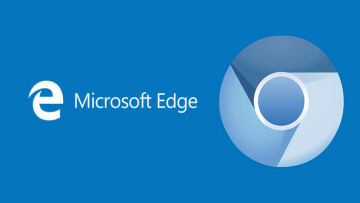 The point is that there are enough apps on a regular PC to configure the system. I don't need more. Of course, Corsair lighting is quite good. You can configure it into individual zones, and create as many lighting profiles as you want. Now we're down to the meat of the subject: performance. This machine is just like the Legion Y730 that I reviewed, with an Intel Core i7-8750H CPU and 16GB RAM. 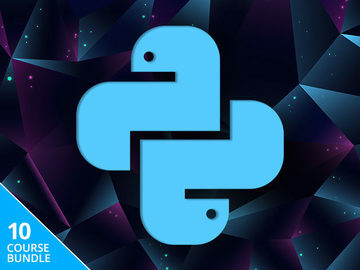 The CPU is a 45W hexa-core chip, and it's a pretty standard part for a macine that's made for powerful tasks like gaming. But then we have the Nvidia GeForce RTX 2080 GPU, which is a massive step up from the GTX 1050 Ti in the Y730. In fact, it's fair to say that the Y730 was for the casual gamer at best. 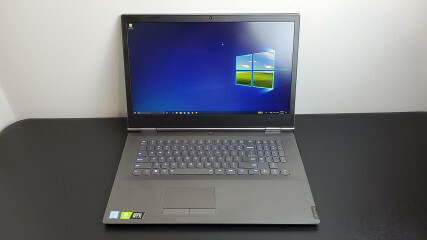 The Y740 can realy get things done. The GeForce RTX 2080 uses the newer GDDR6 memory, and it remains at 8GB like its predecessor, the GTX 1080. The big features are ray tracing and deep learning super sampling (DLSS). Ray tracing is tracing rays of light, and it's not a new concept. The difference now is that it's being done in real time, rather than on graphic design projects where rendering times don't matter. DLSS uses Tensor Cores in the RTX GPU to better the image quality using machine learning. With anti-aliasing, jagged edges are smooth by rendering multiple frames, but with DLSS, only half of those frames are needed and AI does the rest. 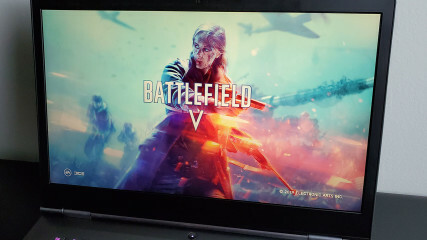 I played Battlefield V for my testing, and just as when I reviewed the HP OMEN Obelisk, it looked great. Well, to be more clear, it looked great when I turned on DirectX 12 and DLSS. In the video below, the 26:17 mark is when I turned it on. You can see a huge difference in the smoothness - mainly because it was awful before that - and the frame rate. As far as battery life goes, just forget about it. 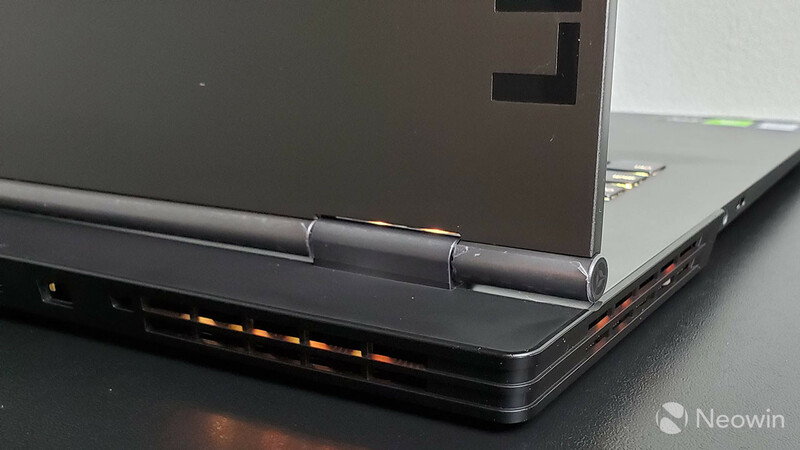 The Lenovo Legion Y730 comes with a 230W charger, and that should give you an idea of how fast this thing will eat through the battery. You'll be able to play games for about two hours before you'll want to plug it in. The truth is that you can have power or you can have battery life. You can't have both. For benchmarks, I used PCMark 8 and PCMark 10. 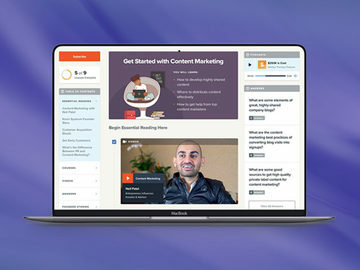 PCMark 8 provides three tests: Home, Creative, and Work. The Home test checks common tasks like video chat, casual gaming, and so on. As you can see, this machine does quite well, and it's no surprise. Next up is the Creative test, which checks more GPU-intensive tasks like mainstream gaming, video editing, and so on. Once again, the Legion Y740 just smokes the competition. 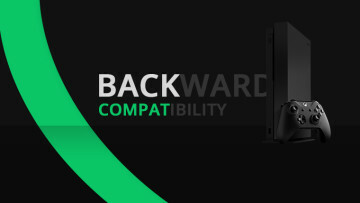 The reason for this is because the Nvidia GeForce RTX 2080 is such a meaningful upgrade, and there really aren't a lot of them out there yet. I assume that if we ran this test six months from now, the results wouldn't be better than 97% of other results; obviously, they'd still be better than most. I was somewhat surprised to see how well the Legon Y740 did on the Work test. Typically, gaming PCs don't do as well, mainly because productivity isn't what they're engineered for. As I said above, I also ran PCMark 10, which is an all-in-one test. On PCMark 10, the Legion Y740 still outperformed all other categories, although it's only 72% better than other results. If we break down the gaming market into three categories, it would be casual, mainstream, and competitive. 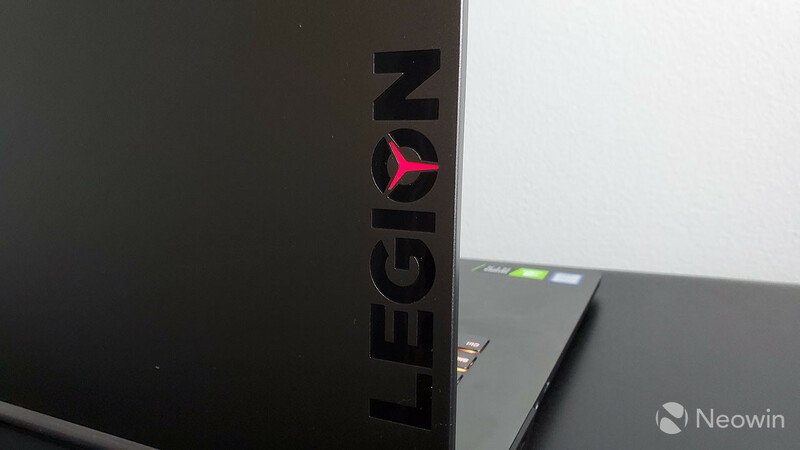 Last year's Legion Y730 would fit into the casual category, while the Y740 would definitely be on the upper end of mainstream. The competitive category would have an unlocked K-series processor, a mechanical keyboard, and some other bells and whistles. And let's face it; this machine has a lot of competitors. Lenovo wasn't the only one at CES that refreshed its gaming laptops with RTX graphics. In fact, pretty much everyone did. So what you have to look for is what's unique about this machine. After all, it has the performance, the 144Hz screen, and so on. Personally, I think it's the all-aluminum Iron Grey design. Like I said a few times, it's just not flashy. It feels like an adult version of a gaming PC. It lights up exactly where and when you want it to, and you can shut it off if you take the machine into work, which many users might be likely to do.